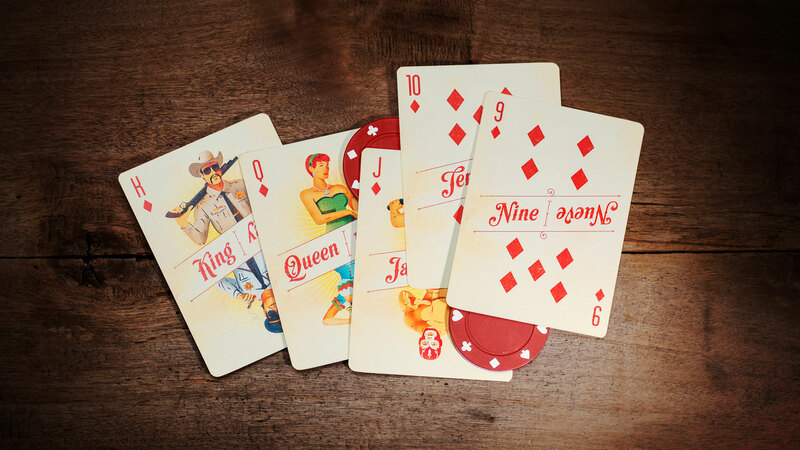 If you’re a lover of beautiful, imaginative print design, chances are you’ve noticed that the humble playing card has been enjoying something of a renaissance in recent years. Often, though, that beauty and imagination are reserved strictly for the tuck box alone, with the cards inside usually resembling the same ones you grew up with. 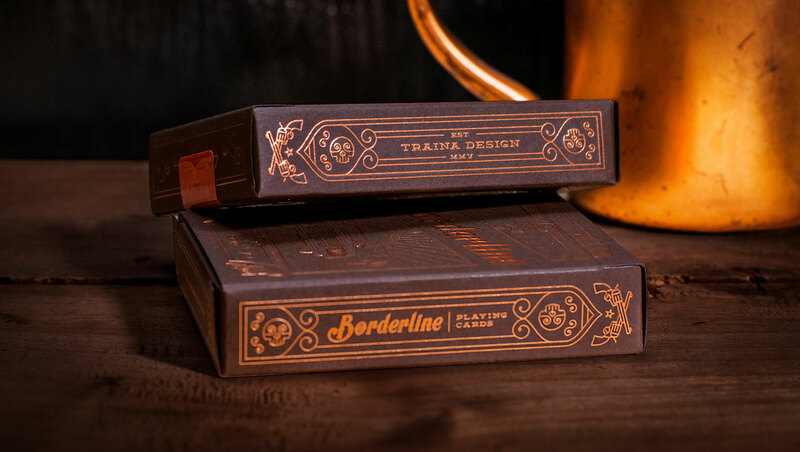 Not so the “Borderline” deck, a labor of love lovingly crafted inside and out by San Diego’s Traina Design to celebrate “the colorful culture and characters along the frontera in our backyard.” Don’t get me wrong – this deck has one gorgeous box, which we will get to shortly. First, though, let’s take a look at those cards. Financed off the back of a successful $15,000-plus Kickstarter campaign launched, appropriately enough, on Cinco de Mayo, the cards have a character all their own. Offset printed on Bicycle playing-card grade paper by the United States Playing Card Co., each of the 56 pieces features that card’s name in both Spanish and English on the front, and a uniform-yet-distinctive design on the back. Yet it is with its 26 face cards that this pack truly sets itself apart from the rest. 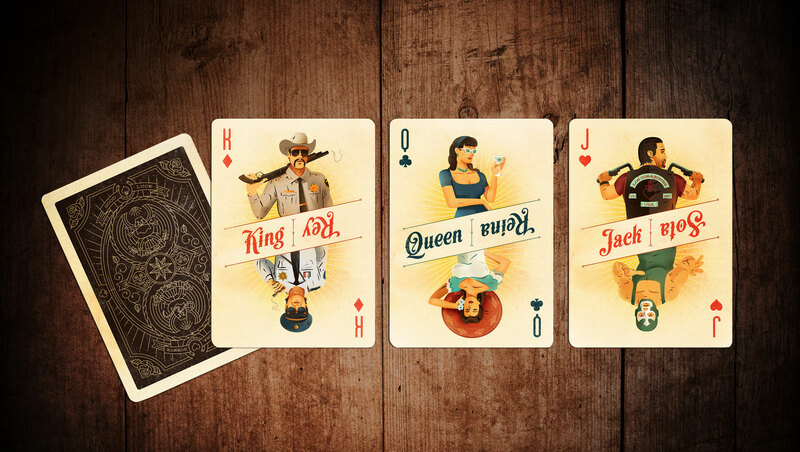 In keeping with the dual-culture theme of the deck, each features two main interpretations of the King, Queen and Jack – one reflecting California, one Mexico – with subtle variations for each of the four suits (hearts, clubs, spades and diamonds). The King, for instance, depicts an American sheriff and a Mexican federale, emblazoned with the words “King/Rey.” The Jack’s masked Mexican luchador wrestler is mirrored by a Californian biker, complete with leather jacket boasting an appropriate motorcycle club name (e.g., Los Corazones [“hearts”] for the Jack of Hearts). 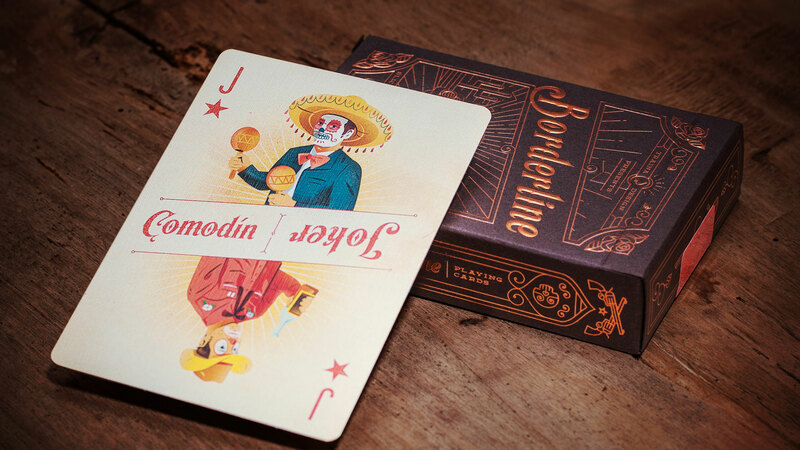 An unusual, printed yellowish tinge to all the cards suggests they’ve been hanging around a saloon on either side of the border just waiting for the right people to come along and enjoy a friendly hand of poker or conquian. 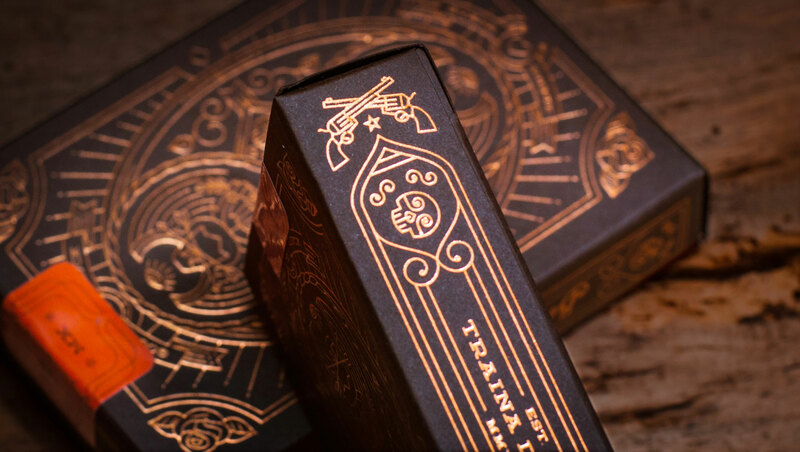 As is often the case with today’s decks, it is with the tuck box that Traina Design has truly pulled out all the stops. 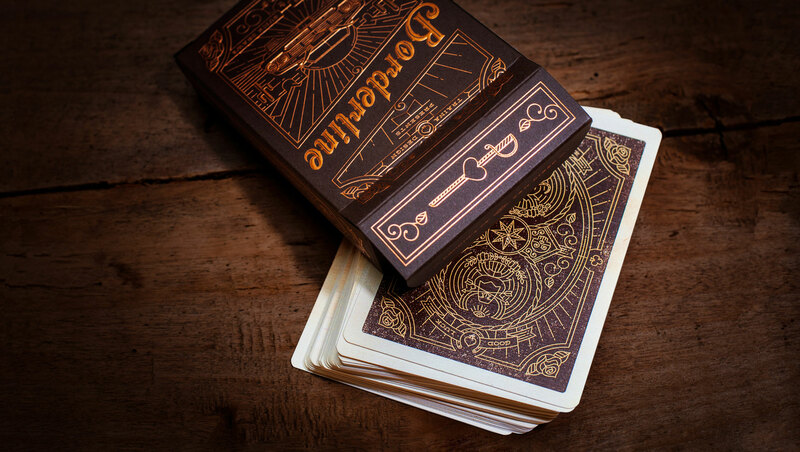 The whole package glimmers with beautiful copper foil, the front being particularly stunning. The delicate line work and embossing on display here really sells the illusion of a bull-horned car heading straight for you, while the distinctive slant of the “Borderlines” title ties in nicely with the way card names are presented within. (If you wouldn’t mind a full-size art print of this cover on your wall, join the club.) Foiled skulls, roses and six-shooters all offer compelling accents to the rich Mahogany hue and soft cotton feel of the Mohawk Strathmore stock [Get Swatchbook]. 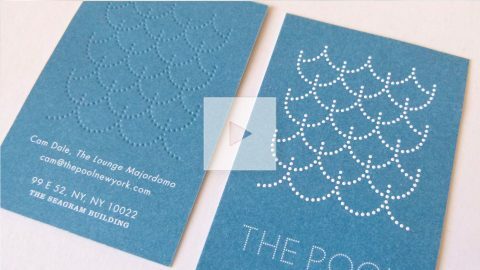 Foil has become such a powerful tool for designers today, particularly with the benefits that digital foil brings, including variable-data capabilities, as well as the ability to accommodate short print runs. 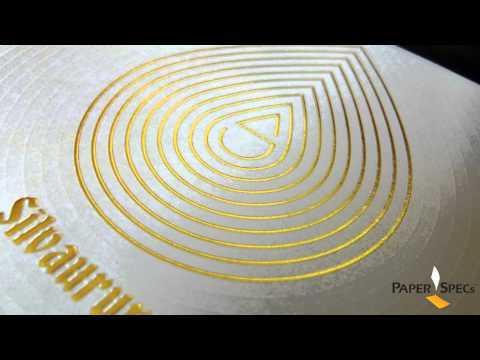 Wish you knew more about digital foil, hot foil stamping, cold foil transfer and foil substrates? Then download our free Foil Cheat Sheet right now! In it you’ll find everything you need to know – from color options to pros and cons – all in one place! 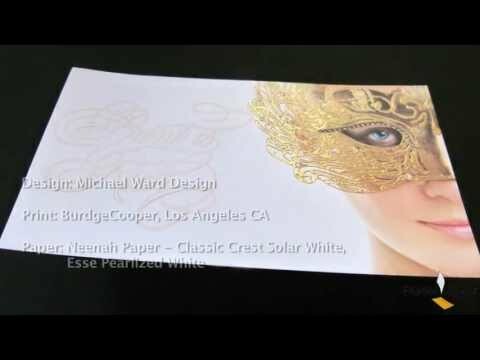 PRO members, don’t forget to check out your PRO Guide to Foil Stamping. Like what you see? Find out more and vote for Client Fortune Teller Tarot . Like what you see? Find out more and vote for Qlix Magazine. Like what you see? 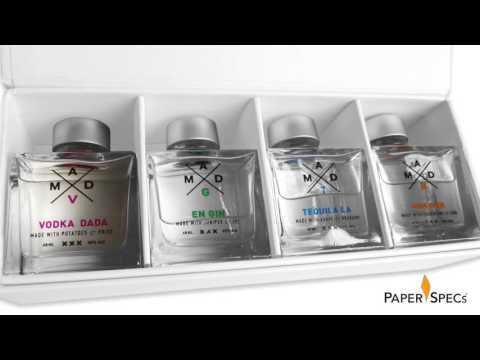 Find out more and vote for ID Image+Design Branding and Identity. 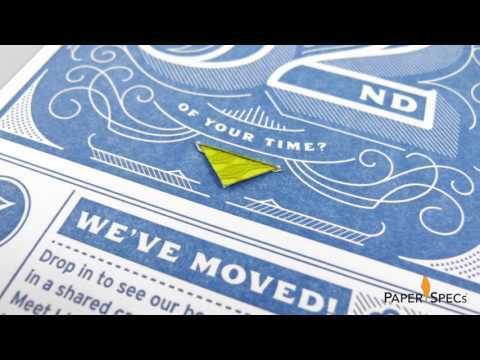 Top 10 Inspirations from Joe DuffyWhat Label Papers are Available for Letterpress?